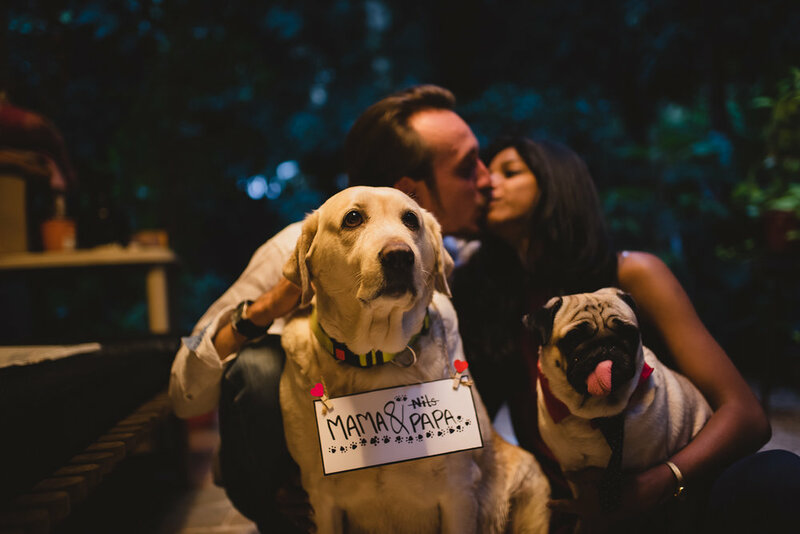 The French groom and our desi girl! 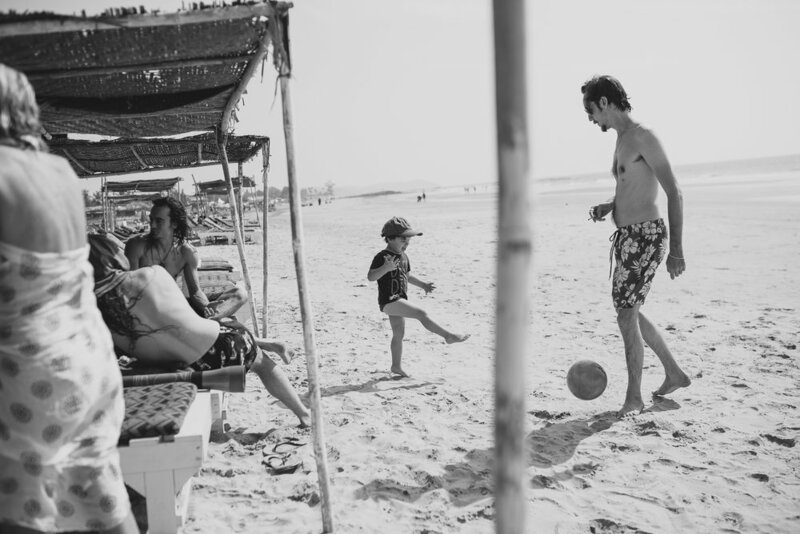 Nils and Padma. We have met in person a few times but little did I know about this lazy couple till I was invited for a pre wedding photo shoot! Usually brides are all set with make up on and few dresses to change and the grooms are busy waiting. On the contrary we had a bride stuck to some series on her computer and the groom sleeping at 2 in the afternoon! Two lazy dogs chilling around. Kick starting with a wedding clothes shoot I was thankful Vishakha and Sakshi were around to throw ideas and opinions at me. Then was the turn to do the couple shoot! These two were so lazy that we only used the area around there apartment and the lane where they reside at. But I did manage a few good clicks! Turns out, one of my pic has been framed multiple times in France! Travel tickets were booked! 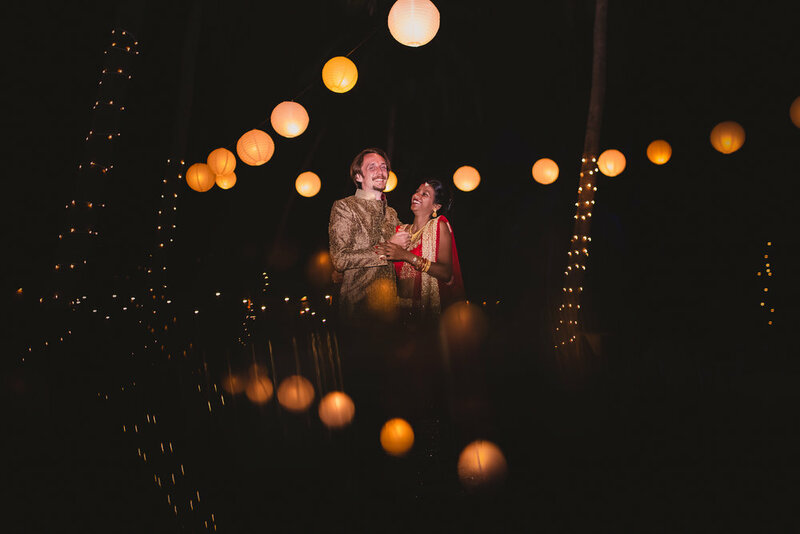 Getting down at Mapusa bus stop, followed by a short half an hour ride, I reached the venue LA Cabana Beach and Spa Resort, Ashvem Beach at around 6 in the morning, my excitement at its peak, covering a French Indian wedding was always a dream! I called Padma! Little did I know she slept late and that the party had already begun! She came out half sleepy off a tent! Walking around we discussed the wedding set up and then she told me oh by the way the decorations guy will be here at 11 for deciding what’s the set will be. WHAT!?!?! Yes these guys are really the epitome of procrastination. Ten in the morning the close family and friends start to pop in for breakfast, most of them hungover! A few who just arrived. Brian the decorations guy also arrived all confused and irritated! He didn’t know he was a covering a wedding the next two days! Sitting aside the three of them discussed for about twenty minutes. And it was done! And to my surprise both the days the set up was absolutely fantastic. 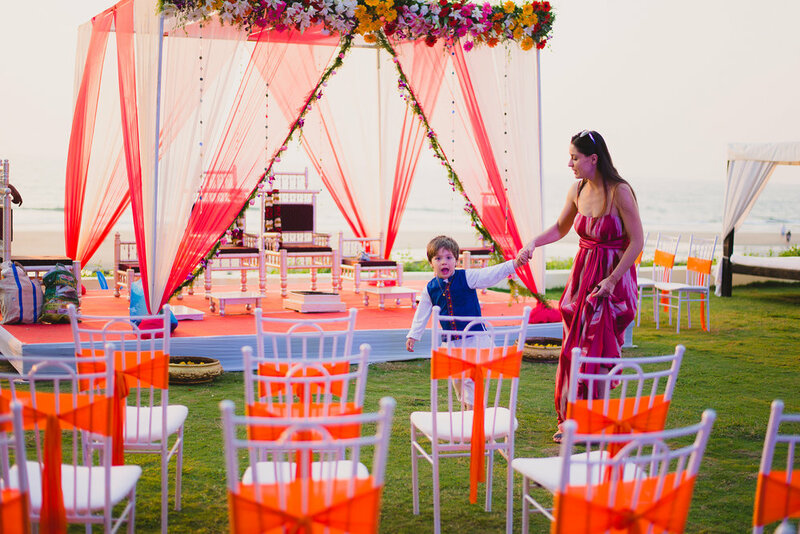 Bright Indian colors for Indian wedding and a white and green layout for the French one. Same spot just the decor changed, very well executed I must say! Brian’s words were – Haven’t seen a couple like this ever in my life! And this is coming from one of the top decor guys in Goa! Around 3 in the afternoon, started the Mehendi of the groom, the most enthusiastic started first, wasn’t a regular Mehendi where people sang and danced, this was one of a kind, lying down on huge cabanas after a huge meal with a sea view, they both were sipping on cold beers talking to friends having a good time with some background music. Friends started pouring down! The wedding minister with his family! The close friends. The most famous Misa’s arrival was the only moment when I saw the bride shed some tears! 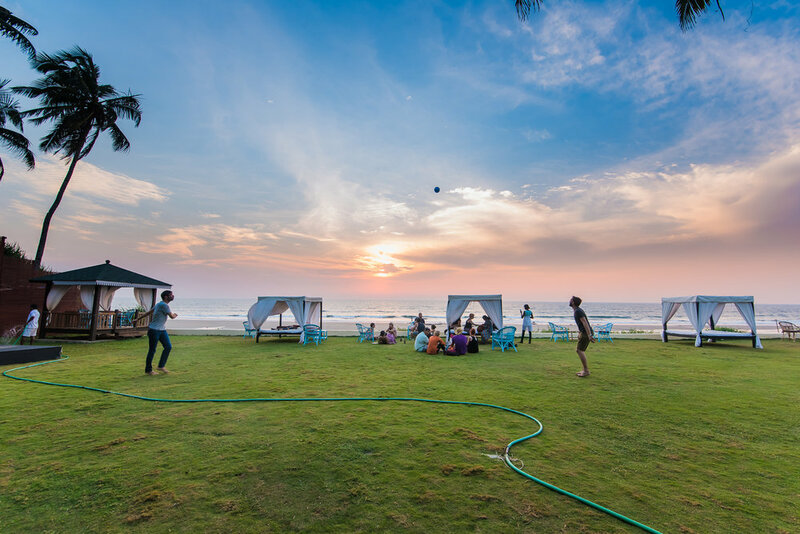 The day ended with getting few amazing clicks of the beach and the close ones enjoying Goa! and the brides parents arrival! 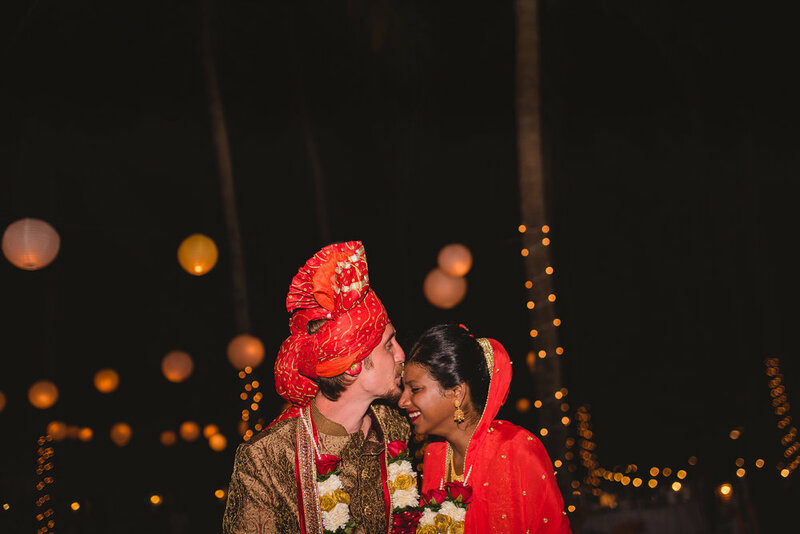 Now we were day one, the Indian wedding day! Followed by a lazy wake up and breakfast, I saw people dressed for Haldi few who missed Mehendi following up! The beautiful groom’s mom all set in a saree! Friends chilling around. And then I noticed Padma mixing the Haldi for herself yelling am going for Haldi! Come. If you want. Chaos! She does create chaos! It’s her ways. Always. 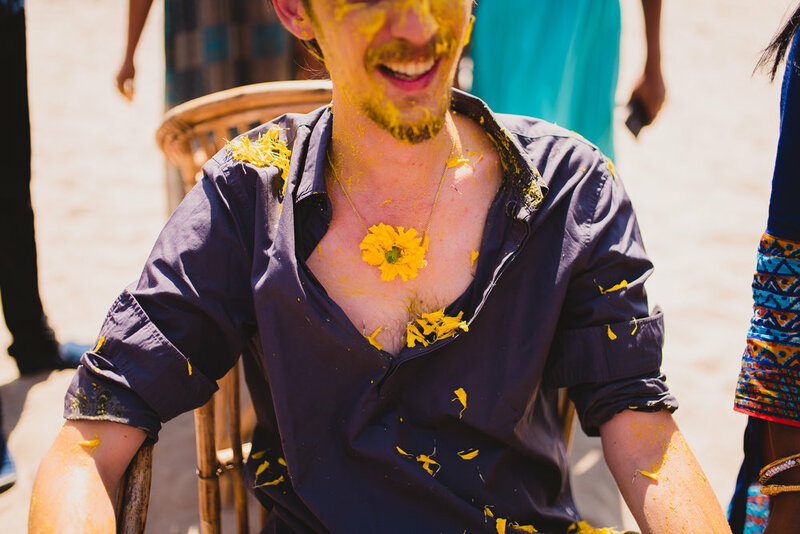 Instructing people how to apply Haldi on Nils she organised a Haldi ceremony I have never witnessed before! It was more like a family Haldi! Bride Groom at same place, both the families doing Haldi for them together! 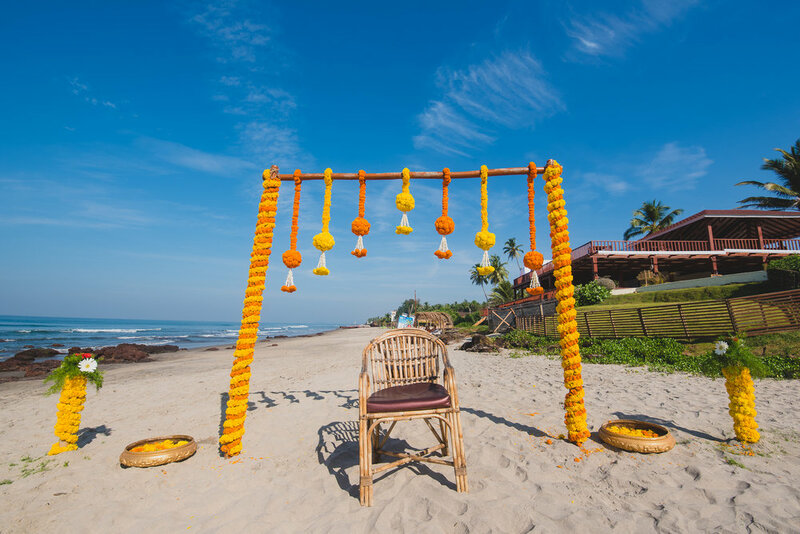 With a finishing stroke of dip in the sea for the couple, the Haldi ended! Off went everyone to their cottages and tents for a nap after a huge meal. Around 4 walking into Padma’s tent I realize there was a problem! Guess what had happened? – Pandit wasn’t picking up her calls and she was having this conversation with a friend saying dude go get some Pandit clothes for yourself, outside around the living area of the tent was Nils finding new Pandits on his IPad :D. Really this was some drama! I decided to calmly walk away and get a few venue clicks done! 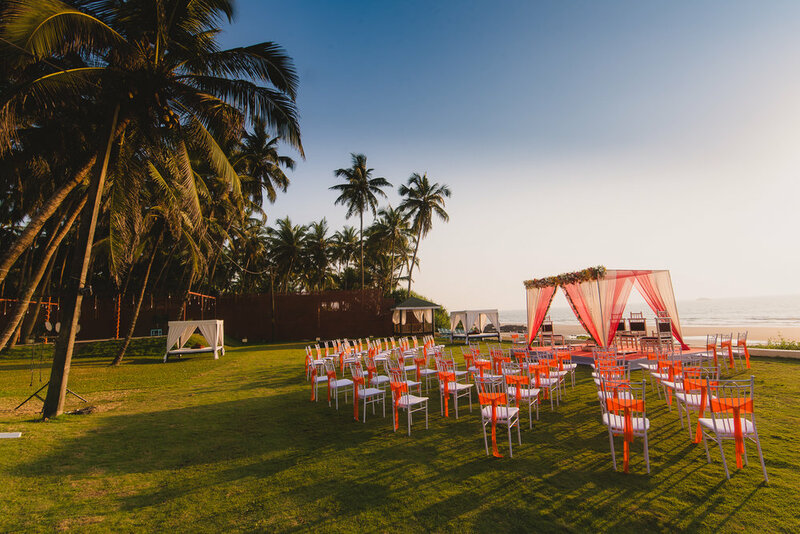 The Indian Wedding set up! Seats were counted! 70 people. Brian was setting up the dinner area! Past an hour walking around the beach getting some clicks, I return to the venue to see friends are all dressed up ready for Safa tying! The groom is dressed! Clicking few pics I enter the brides tent, it’s 5:30 pm, she is sitting down on her bed in her boxers having a big laugh session with her friend! And here I wanted make up pic! Walking out the groom is ready for Safa tying! I click some good sunset pics! And as the sun is setting I could feel Nils’s impatience to Where is Padma? So I walk back to her tent to see progress! She has her friend doing her makeup. One girl stitching the laatkun to her lehenga! Still not ready for me. So I walk out yet again to see, what’s the status of the barat! And guess what I see, both families all set for Nils’s barat. Again one of a kind! After a good hour of friends and family, mother-in-laws dancing together, brides uncle, the famous mama ji instructing the Pandit to do the way he wants the wedding to follow! He walks to bring back the bride from her tent! Walking out! Padma looks so different! Couldn’t believe this was the same girl who was chilling in her boxers an hour back! Her close ones jump in to dance with her, yes! She came out dancing and happy! Followed was the quickest wedding I ever witnessed. I mean seriously 20 mins and Kanyadan, Varmala, Phere, Sindoor were done. Wasn’t like anyone was waiting for me to get few clicks! It was what I could really manage in reality and this wasn’t the reality I could alter! But I must say I manged a few good clicks here too! Followed was a very well organized dinner! And of course the party! People drank happily, danced away to glory, sang away to glory! Happy people everywhere! I don’t clearly remember when the night swam by!